"The zip from salsa will wake up your taste buds when you bite into this hearty handheld meal on-the-go." In a nonstick skillet, saute onion and green pepper in butter until tender. In a bowl, beat the eggs, milk, salt and pepper. Pour over vegetables in the skillet. Sprinkle with cheese and bacon. Cook and stir gently over medium heat until the eggs are completely set. Spoon 1/2 cup down the center of each tortilla; fold sides over filling. Serve with salsa if desired. 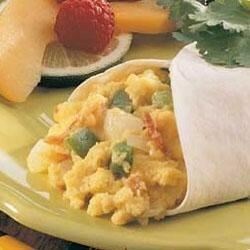 Wonderful breakfast especially with homemade tortillas of Allrecipes. I made these burritos with fresh peppers and tomatoes from the garden and they were so delicous!